Thus read the headline of Kathy’s post on facebook this week. 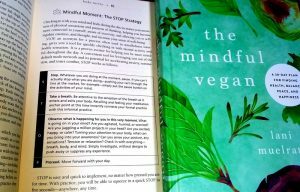 Now ten days into her study of The Mindful Vegan: A 30 Day Plan for Finding Health, Balance, Peace, and Happiness, Kathy was armed with new strategies from her reading and practices from the book. She became inspired to try something new in the face of cravings. Something she’d never tried before. 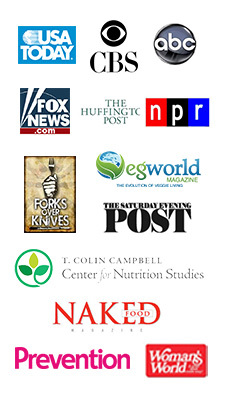 Kathy’s benefits from beginning the practices and strategies from The Mindful Vegan, as you will see, have been very reinforcing and positive. 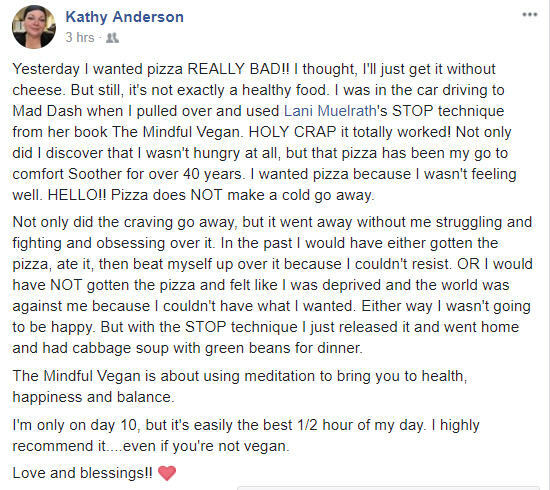 Here is the rest of Kathy’s post, detailing action she was able to take in the face of cravings – a direct result of applying the practices for mindfully navigating cravings that she had studied in The Mindful Vegan. For anyone who, like Kathy and myself, has experienced the horrors of being in the grips of cravings without a thing to do about them except indulge in cravings call, try to distract ourselves from cravings, or white-knuckle them through until the tension became so overwhelming that you caved to the cravings anyway, the S.T.O.P. strategy completely changes the game. Coupled with the daily mindfulness practices as Kathy had been doing daily from Day One in The Mindful Vegan, you have the skills and practice to follow through in step-by-step fashion. Kathy had also been inspired by the video presentation The Three Causes of Cravings and What to Do About Them. Combined with her reading and practice early on in reading The Mindful Vegan, Kathy learned that conditioned reactivity to cravings can be completely shifted using the tools of mindfulness. This releases us from the misery of the craving cycle and opens us to living with greater skill, ease, and happiness. Once you learn the simple strategies that can free you from getting caught up in the craving cycle, you can live with greater freedom and balance. With the S.T.O.P. strategy, you interrupt the craving cycle that leads to its weakening and extinguishing. This is in contrast to suppressing a craving, distracting yourself from it, or replacing what you crave with something ‘less unhealthy’. Though healthier choices may be better for your health, they still reinforce the craving cycle. Thank you Kathy for sharing your story in such detail and clarity! This is so motivating. Thank you to Kathy for sharing from her personal experience. 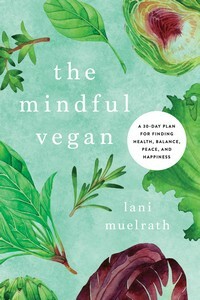 I have just started reading The Mindful Vegan and haven’t yet reached this chapter yet, but am mighty glad to k now it’s coming up. Hi Sharon! Kathy really nailed it, didn’t she? She said in such clear, direct language her experience. I am so excited for her – this is good news! Simple strategies learned via mindfulness training change your world. 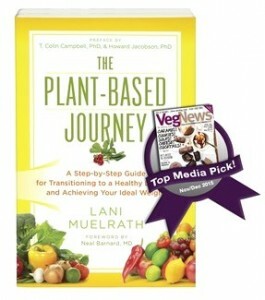 So glad you are enjoying The Mindful Vegan! Keep me posted!